Specialist Nutrition Rehab is committed to ensuring that your privacy is protected. Should we ask you to provide certain information by which you can be identified when using this website, you can be assured that it will only be used in accordance with this privacy statement. 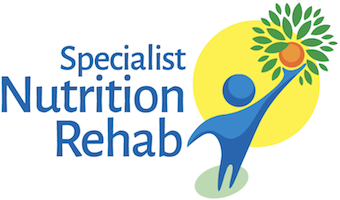 Specialist Nutrition Rehab reserves the right, at its discretion, to make changes to any part of the Website, the Information or these Terms. Specialist Nutrition Rehab may change this policy from time to time by updating this page. It is important you check this page from time to time to ensure that you are happy with any changes. If you no longer wish to receive a newsletter, you can unsubscribe at any time by clicking the unsubscribe link in the footer of any email you receive from us, or by contacting us at info@specialistnutritionrehab.co.uk. A cookie is a small file which asks permission to be placed on your computer’s hard drive. Once you agree, the file is added and the cookie helps analyse web traffic or lets you know when you visit a particular site or page. Cookies allow web applications to respond to you as an individual. The web application can tailor its operations to your needs, likes and dislikes by gathering and remembering information about your preferences. Specialist Nutrition Rehab use traffic log cookies to identify which pages are being used. This helps us analyse data about webpage traffic and improve our website in order to tailor it to customer needs. We only use this information for statistical analysis purposes and then the data is removed from the system. Overall, cookies help us provide you with a better website by enabling us to monitor which pages you find useful and which you do not. A cookie in no way gives us access to your computer or any information about you, other than the data you choose to share with us. Specialist Nutrition Rehab does not use cookie technology to collect Personal Information. You may also wish to refer to www.allaboutcookies.org. We will not sell, distribute or lease your personal information to third parties unless we have your explicit permission or are required by law to do so. Employees, associates and agents of Specialist Nutrition Rehab may be given access to any Personal Information which we collect, but their use shall be limited to the performance of their duties and in line with the reason for processing. Our employees, associates and agents who have access to your Personal Information are required to keep that information confidential and are not permitted to use it for any purposes other than to enable you to use the Website or to deal with requests which you submit to us. You may request details of personal information which we hold about you. If you would like a copy of the information held on you please write to Specialist Nutrition Rehab info@specialistnutritionrehab.co.uk. If you are concerned that we have breached a privacy law or code binding on us, please send an email marked “Urgent” to Sheri Taylor, Director, at info@specialistnutritionrehab.co.uk. We aim to respond in a reasonable time (normally 24 hours). Our Data Controller will manage your complaint and will give you additional information about how it will be handled.